From past many years, we are engrossed in providing excellent quality Cold Feed Extruders to our clients. These extruders are ideally used for different types of rubber and sealants. We offer Cold feed Extruders in plain barrels in ‘Vented’ ‘Non-Vented’ designs. 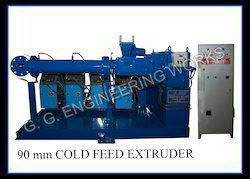 Our range of cold feed extruders is replacing the conventional hot feed extruders in the field of rubber extrusion. By eliminating the warm up mill before feeding a cold feed extruder helps in economic sense as well as reduces the heat cycle for rubber compounds.